Welcome to the most detailed AT&T Stadium Seating Chart on the internet. Formerly known as Cowboys Stadium, this entertainment mecca seats 80,000 and is home to the Dallas Cowboys. Below you will find AT&T Stadium seat views, row and seat numbers, club seat information, best seats for the Dallas Cowboys, plus cheap Cowboys Tickets. Note: Hover over the sections on our website or mobile app to see seat views and row numbers. 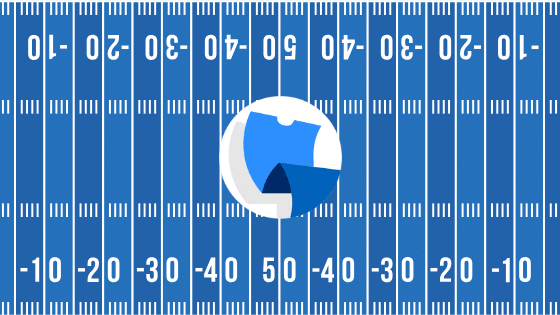 This season, TickPick is providing fans with its new patented interactive system that gives the user a full, 360-degree virtual in-seat view that they can utilize before picking their seats! The seat numbers at AT&T Stadium go from right to left when looking at the field from your seats. This means that the right side of the section when facing the field will start with seat number 1 and work its way up to seat number 20 to 30 depending on the section and row. This also means that seat number 1 at AT&T Stadium will always be on the aisle next to the adjacent section with the lower section number. There are three different tiers of club seating at AT&T Stadium, in the 100, 200 and 300 levels. All club levels will provide access to private entrances, premium club lounges, upscale food and beverage options, plus wider and padded seats. The 100 level club seats, AKA The Hall of Fame are located along the sidelines. These are the premium seats in Jerry’s World, offering the best sight lines, and include exclusive access to the Lower Level Club Concourse, where you can watch the players take the field. These sections have 22 rows of seating. The 200 level club seats, AKA The Main Club are located along the sidelines. Unlike the Hall of Fame seats, these provide perfect views of not only the field, but also that massive video screen. You can argue that these are the best seats for the Dallas Cowboys because of that. These sections have between 12-14 rows. The 300 level club seats, AKA The Mezzanine Club are located along the sidelines. These are the farthest club seats from the field, but like the Main Club provide a great view of the massive video screens. The section itself is steeper than the other club sections, and have 16 numbered rows of seating. The best seats for a Dallas Cowboys game at AT&T Stadium are located in any of the club level seats closest to 50 yard line. Many Cowboy fans will tell you that the 200 level club seats are best, since you have plenty of heigh to see the entire field, and are also far enough back to have a full view of the giant video board. The Dallas Cowboys bench is located in front of sections C108-C113 and the visitors bench is located in front of sections C133-C138. If you are just trying to have a good time at Cowboys game or any other event at AT&T Stadium, sections 425-429 and 455-460 are the place for you. These sections are very close to the bars on the concourse, which include table top seating areas. These sections usually have some of the cheapest tickets available for Cowboy or college football games, so you can use that extra cash you saved on overpriced drinks! 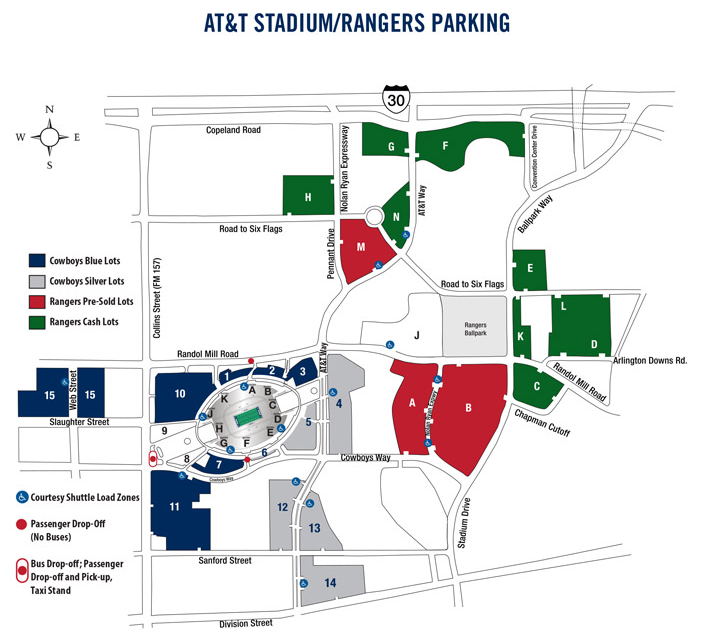 AT&T Stadium and Texas Rangers Ballpark share lots of football Saturdays and Sundays, with approximately 12,000 spaces at AT&T Stadium and 12,000 at Texas Rangers Ballpark. Shuttle service is available for guest with disabilities or that have limited mobility. Tailgating is permitted in designated spaces only, which are located on the perimeter of several lots when there is a grassy area behind the parking spot. Lots with tailgating spaces include 4-15. With high prices come high service fees with many marketplaces, but not TickPick. Here at TickPick, we have no service fees, making us your source for the cheapest Dallas Cowboys tickets on the secondary market. 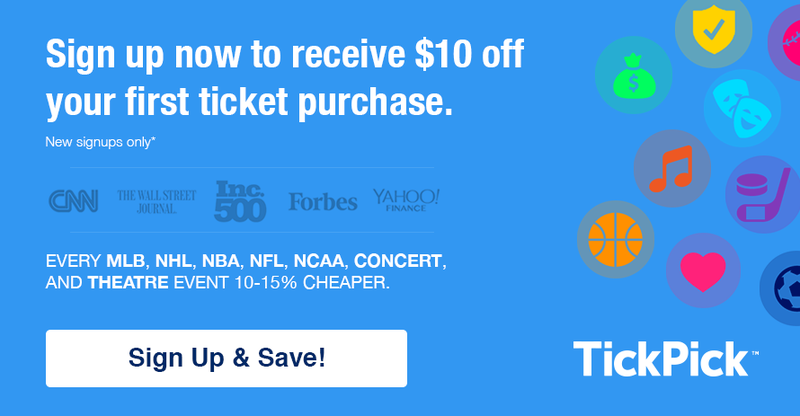 If you haven’t used TickPick before, you can sign up with the link below for $10 off your first purchase. If you have any questions regarding the Dallas Cowboys, please feel free to submit a request here.